Thierry Chesnot/Getty ImagesU.S President Donald Trump and French President Emmanuel Macron attend the traditional Bastille day military parade on the Champs-Elysees on July 14, 2017 in Paris France. 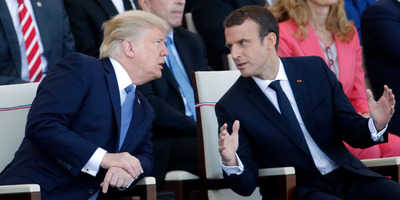 Donald Trump and French President Emmanuel Macron spoke on Sunday and agreed to coordinate a “strong, joint response” on Syria. Bashar al-Assad’s regime in Syria is suspected of using chemical weapons that killed at least 40 civilians and injuring hundreds more on Saturday. Macron previously declared Syria’s use of chemical weapons a “red line” and said, if ever confirmed, France “will strike” in response. President Donald Trump and his French counterpart, Emmanuel Macron, agreed the US and France will plan a “strong, joint response” on Bashar al-Assad’s regime in Syria. The US and France, along with other nations, called for an emergency UN Security Council meeting to be held on Monday “in reference to the horrible chemical weapons attack on innocent civilians in Syria,” UN Ambassador Nikki Haley tweeted Sunday afternoon.